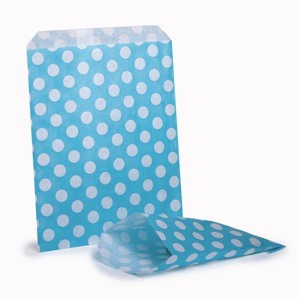 Our charming Light Blue Polka Dot Paper Bags are great for a wide range of uses! These classic bags are made from strong Kraft Paper and are printed with an attractive and colourful polka dot design. They are sourced from the UK and are of exceptional quality. These bags are great for greeting card shops, sweet shops and anyone who wants to achieve a nostalgic feel. Below is a list of the technical information regarding Polka Dot Paper Bags. If you require any further information please contact us on 020-3002-9960. Printed all over in a Polka Dot design. Bags are in bundles of 100 and packed in 1000s. Picture is for illustrative purposes only, if colour is important, please ask for a free sample. To see our reviews please visit ourTrustpilot page.